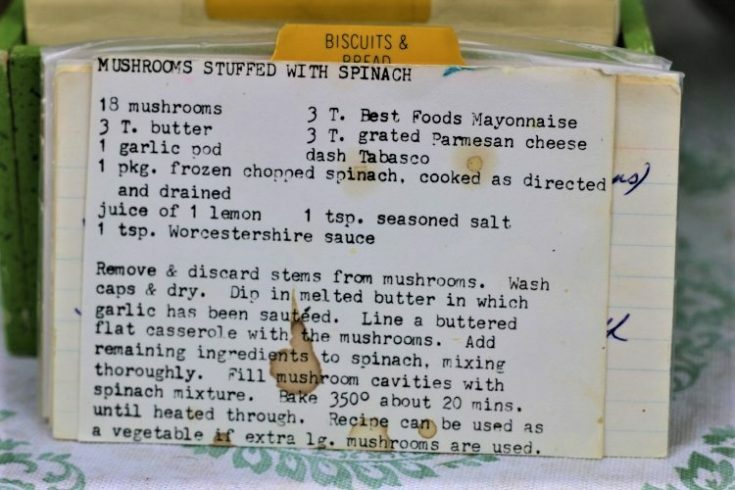 Front of the recipe card for Mushrooms Stuffed With Spinach. There are lots of fun recipes to read in the box this recipe for Mushrooms Stuffed With Spinach was with. Use the links below to view other recipes similar to this Mushrooms Stuffed With Spinach recipe. 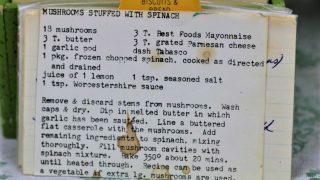 If you make this Mushrooms Stuffed With SpinachMushrooms Stuffed With Spinach recipe, please share your photos and comments below! Remove & discard stems from mushrooms. Dip in melted butter in which garlic has been sauteed. Line a buttered flat casserole with the mushrooms. Add remaining ingredients to spinach, mixing thoroughly. Fill mushroom cavities with spinach mixture. bake 350° about 20 mins. until heated through. Recipe can be used as a vegetable if extra lg. mushrooms are used.